Heat oil in a non sticky cooking pan. Brown chicken (4-5 minutes). 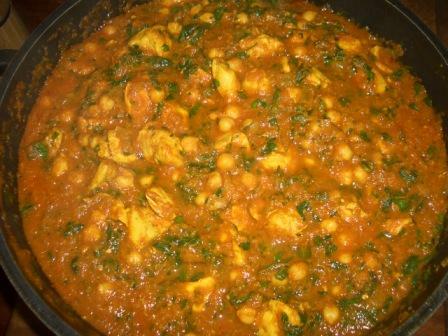 Add the chick peas, Ethnic Cottage Punjab Spinach Sauce and one jar of water (15 oz). Cook for 15-20 minutes with occasional stirring till the chicken is fully cooked. Transfer to a serving dish. Serve with Indian flat bread (Naan) or Basmati rice. Basmati rice is more traditional but any white rice works well. Use Boiled and peeled potatoes instead of Chicken and chick peas to make alu palak. Do not add water if you like your Potatoes on drier side.